Debt is not all bad; there are some situations where taking out a loan or spending with credit is appropriate. Few people could manage to buy a home without a mortgage. Many young people could never afford their first car without a car loan. Lots of college students need to take out student loans to cover their tuition and expenses while studying. Trying to avoid debt completely in the modern economy is unrealistic. Taking on more debt than you can afford is a recipe for financial disaster. 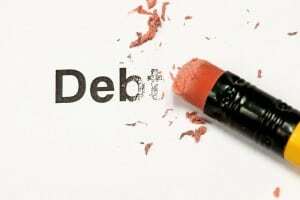 Debt repayments should be less than 30% of your total income. The trick is in debt management; good management of your debts means that you retain a good credit record so you’ll have access to credit when needed. So, here are some debt management strategies that will help you avoid personal financial disaster. A good credit record is something that you need to work hard to keep; it’s a statement as to how well you manage debts. It is very difficult to get a loan without a good credit rating. This makes taking out your first loan a little tricky but there are steps to facilitate this. If your credit score does suffer, because of late payments or defaulting on a loan, it is possible to get a good rating back, over time. You will need to re-establish a good payment record and you can often request that your rating be improved. Make sure you regularly get a copy of your credit report from more than one national credit reporting agency. Errors do occur but there are steps you can take to get them rectified. One of the best ways to avoid a bad report is to keep in constant communication with your lenders. Contact them as soon as you realize you aren’t going to be able to meet your obligations. These companies get very tetchy when people ignore their letters and phone calls. Trying to hide from creditors never works in your favor! When you are considering taking on a loan, look at your borrowing options. Interest rates vary and the first deal you find may not be the best. Some loans attract a tax deduction of the interest, while others have special repayment conditions that could be beneficial to you. Take the time to compare various loan packages. Educate yourself about all aspects of borrowing to make sure you get the best deal available. This strategy is also a good move at different times through the term of a loan. Periodically check whether there is a better deal out there that allows you to reduce the total cost of your debt. Sometimes debt consolidation, where you combine several small debts into one larger one, is a good option to help you lower your repayments. Reducing the total cost of your debts is a sensible debt management strategy. As well as consolidation, you might be able to refinance at a lower interest rate; transfer balances on your credit cards to another card that has lower interest rates (often, credit card companies will offer a low rate on transferred balances, so this could be a good way to lower your costs). If you have built up equity in your home, you might be able to borrow against this to help pay off high interest loans or cards. Ever had trouble meeting a monthly loan repayment? I have and it can be pretty stressful, to say the least. As I said earlier, the very worst thing you can do is ignore the situation. Most companies will deal with you much more favorably if you contact them before they have to contact you. The sooner you get the situation resolved, the fewer over-due charges you’ll have to pay. Most lenders will try and help you. After all, they want to get their money back so it’s in their best interests to work with you to try and resolve the situation. Ask for a revised payment plan to help you get on top of your debt obligations. Credit card debt accounts for a huge percentage of financial woes. If you have multiple cards, or only ever pay the minimum repayment amount each month or use one card to make the repayments on another, you need to use some serious strategies to fix the situation. There are different methods to help you do this; one of my favorites is the snowball method, where you pay off one card at a time, using the freed-up extra money to pay off the others. The best debt management strategy is to know where you stand. Make a list of every loan, store and credit card with the interest rate and repayment amount. If you are over-extended, take steps to reduce your liability. Use your budget to work out how much you can afford to repay and try and negotiate a better deal with your lenders. If your budget doesn’t balance, look for ways to cut spending to free up extra cash. Control your spending on unnecessary items and avoid the use of credit and store cards (these usually have the highest interest rates of any form of credit). Use cash for all essential purchases; otherwise you end up paying way more than the ticket price because of the interest of cards. You cannot keep trying to live on borrowed money. Use these strategies to help manage you debts so that you can avoid financial disaster. “Trying to avoid debt completely in the modern economy is unrealistic.” Really? Perhaps this is why the “modern economy” is so screwed up. So many people are brainwashed to believe that a statement like this is true. I don’t think it is unrealistic at all to completely avoid debt. It’s not likely to happen for most people, but it is still a noble goal. I am not so sure. I think we need to be realistic with what we strive for. I am not advocating debt, I am just pointing out how for things like houses and tuition, we often don’t have a choice. The trick is to make sure you only bite off what you can chew. Great post – thanks! I’ve been pondering debt management this week and am about to open a new bank account for ‘found money’. Whether I put with all proceeds directly into debt management or investment I’m not sure yet. You’ve really given me food for thought. That sounds like a great idea. You will be amazed at what kind of extra money you can find to use for this. Good luck.